I have written a lot about the health benefits of millets in my earlier post on millets. This upma is prepared with varagu known as kodo millet in English, is gluten-free, highly nutritious, fiber rich and is very filling. It is easy to prepare and takes very less time to make this healthy upma. 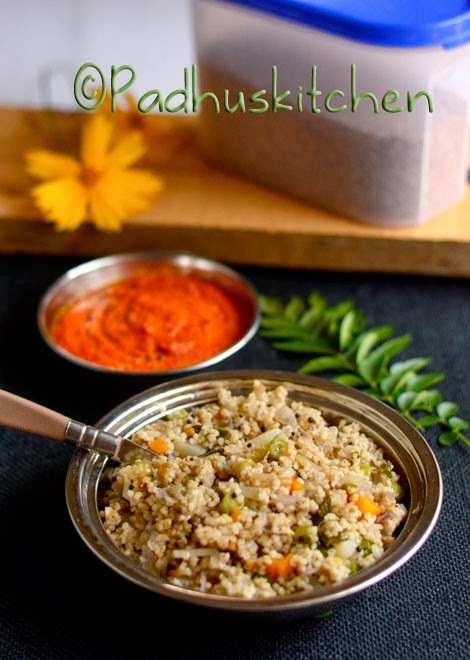 Today we will learn how to make Kodo millet upma following this easy recipe. Finely chop onions, ginger and all the vegetables. (You can use a mix of carrot, peas, beans and potato) Diabetics should avoid potato. Wash millet, drain the water and keep it aside. Heat oil in a pan, add mustard seeds, when it splutters, add urad dal, red chillies and hing. When dal turns golden brown, add finely chopped onions, green chilli, ginger, curry leaves and saute until onions turn transparent. Then add all the vegetables (carrot, beans, peas and potato) and saute for a few minutes. When water starts boiling, lower the heat and add the millets stirring continuously. Cover and cook on low heat stirring from time to time. Note - You get varagu (kodo millet) with hull and without hull. I have used varagu with hull, that is why it is brown in color. Whether you use kodo millet with hull or without hull, the method is the same. Super healthy and tasty upma. Love to try it some time. Very healthy and traditional food.Thanks. Very nice recipe, healthy and delicious too.. If you are in chennai please tell me where are you buying varaghu with hull? Can you give me the english name of the millet? Check out this post Arthi on How to cook millets for English names of millets. I used to Post after trying the recipe. Today our dinner was varagu upma with carrot,beans. Satisfied for having healthy dinner. Thank u padhu mam..
3 cups of water is enough to cook 1 cup of millet. If you add 4.5 cups of water, it will be millet khichdi. Thanks for all your recipes. I survive single mostly on your recipes. Can you share what kind of cookware you have used in these pictures? Thank you. This is just non stick cookware. I prefer to cook in kadai mostly. Only when I cook for the blog, I use non stick so that it will look good in the pics. Very healthy and tasty Upma. Thanks for sharing the recipe. i have varagu which is white in color so it is without hull?? the water ratio is same for with and without hull?? 2 1/2 cup too dry, you may add 3 cups of water.